In early August, Larry Kudlow of CNBC’s “Kudlow & Co.” asked Sarah Palin about the possibility of becoming McCain’s running mate. Well, it appears that she got the answer! Nice donkeys! 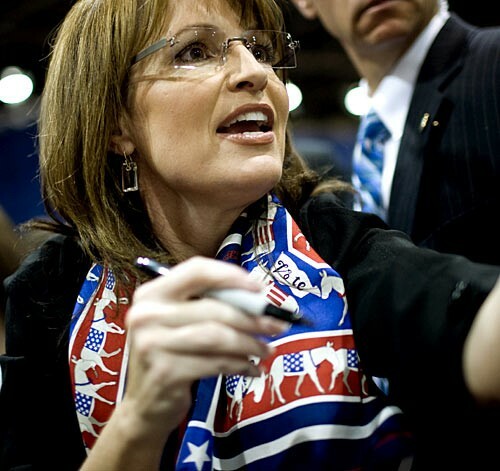 I wonder if that was on sale, so the RNC picked that up to offset the rest of the $150,000 they’ve spent on clothes and make-up for Palin (and family) in the past two months. Maybe her trips to Saks and Niemen-Marcus are designed to offset the tumbling economy. Especially since she doesn’t view paying taxes as being patriotic, this must be her way of being pro-America (unlike all those bad parts of America that she doesn’t like to go to). Poor John McCain, though. It appears her idiocy is contagious. He has lost what little eloquence he ever had. I really hope that someone out there comments with Biden’s latest words about Obama being tested in the next six months. As much as FOX “News” likes to portray this as an invitation for a terrorist attack, how can anyone honestly look at the situation with the global economy and think that the incoming president will have any more than six hours before he’s tested. I will agree, it was a dumb thing to say. Or at the very least, a confusing thing to say. Certainly, Obama seems to demonstrated remarkable levelheadedness throughout the campaign, so perhaps Biden was trying to draw people’s attentions to that. I don’t know. However, I do think regardless of the outcome of the election, the new president will face some serious – and immediate – trials. One of the great moments of irony recently was while I was watching FOX “News” (on the treadmill), and they had Republican Senator George Allen on, and he commented how Bush was indeed tested by the Chinese during his first six months in office when they shot down and held a US Air Force plane. In Allan’s estimation, this was little more than a test of the then-new President’s mettle. Oops. Guess FOX didn’t expect that. Much stuttering ensued on “Hannity & Colmes,” quite possibly the worst show ever. Hooray for FOX News! !Jordan, you shouldn’t be watching that channel 🙂 Leave that to me…I’ll be in the good ole US of A on Monday.